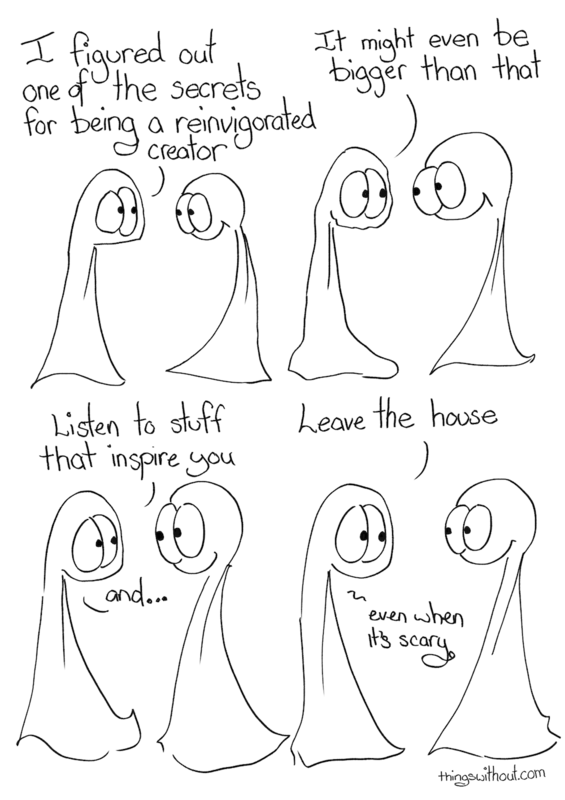 Leaving the house or comfort zone can be hard sometimes, really really hard. It’s a muscle that can get out of shape, but it can renew. I sketched this comic after chatting to Sanford Biggers about creative practice and ways to grow while I was at ACA (that’s Atlantic Center for the Arts in this context!). Sanford’s a fantastic artist, so smart and skillful around how he navigates (and hacks) so many subjects and aspects of living. What a time for this drawing to go live! Now is a good time to check out Sandford’s work if you haven’t, or revisit it. His work speaks to the tough stuff of right now, though he has joy too. He creates art that resonates from now and draws on deep roots, he’s in MOON MEDICIN multi-media concept band that performs against a backdrop of curated sound effects and images of sci-fi, punk, sacred geometry, coded symbology, film noir, minstrels, world politics, and ceremonial dance, he did a TED talk in 2016 about his work on racial violence. Thing 1: even when it’s scary. There are many ways to leave the house. Even many different ways to train muscles to be strangers. You don’t _have_ to like anyone, tolerate will do! I think sometimes, this might not be for you but it is for some, folks get too many “oughts” and “shouldas” which makes being around strangers too much and too intimate.